The Geffrye Museum is one of London's best-loved museums. It shows the changing style of the English domestic interior in a series of period rooms from 1600 to the present day. We are currently working with the museum to enable them to digitise their collections information and create public access to the collections online. The first phase of this major project, funded by the London Museums Hub, was completed in 2007. 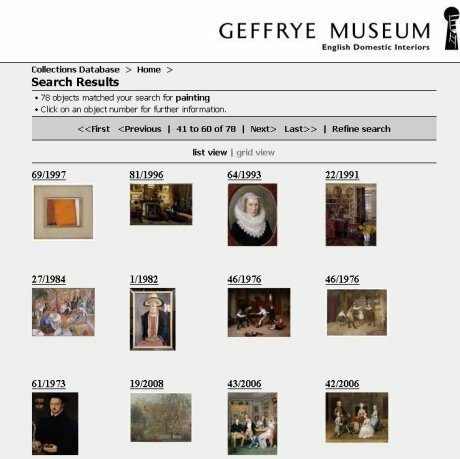 We have supplied the Geffrye Museum, London with our MuseumIndex+ collection management system together with the BooksIndex+ book cataloguing system. The system will provide for cataloguing the museum's collections including support for procedures in line with the Collections Trust SPECTRUM standard. An intranet site built on top of this allows the museum's staff to search and view the data. Wider access to the collections has also been put in place: the Geffrye Museum website is being enhanced with public access to the catalogue; in addition the OAI Gateway provides access to the collections through the OAI interface of the 20th Century London project, PNDS, (Peoples Network Discovery Service); and the Z39.50 Gateway will enable Z39.50 clients globally to search across the book records stored in BooksIndex+.